The Montana Climate Office relies on the Natural Resource Conservation Service for snow monitoring. It is a complex topic, and there is a great need to develop this topic further. A nice compilation of current and historical SNOTEL data for most of the west compiled by Drew Slater with the Cooperative Institute for Research in Environmental Sciences in Boulder, Colorado. Click on a SNOTEL station location for comparison to the long-term record. 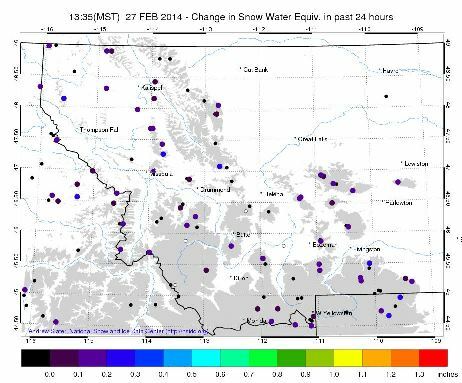 Change in snow water equivalent. View full screen map.